What are the different types of lupus rashes? Who gets discoid lupus and can it turn into systemic lupus? Drug-induced lupus erythematosus: Drug-induced lupus is a rare, almost always temporary form of lupus that can occur as a side effect of certain medications, including several drugs commonly used to treat heart disease and hypertension. Unusual when compared to statistics for other forms of lupus, men are more likely to develop drug-induced lupus than women. Drug induced lupus only occurs after long-term (months to years) daily use of a medication, and once the medication is stopped, symptoms of drug-induced lupus typically disappear completely within six months. Drug induced lupus does not lead to systemic lupus. There are several types of cutaneous (meaning of, relating to, or affecting the skin) lupus rashes. In this blog, we will be focusing primarily on the discoid lupus rash. For reference, the other types of lupus rashes are described below with accompanying images. 1. 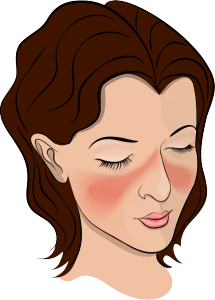 Acute cutaneous lupus (also known as the lupus butterfly rash or malar rash): Derived from the Latin word ‘mala’ which means cheekbone, the malar or butterfly rash is a kind of skin condition typically characterized by the appearance of rashes across the cheekbones and over the bridge of the nose. 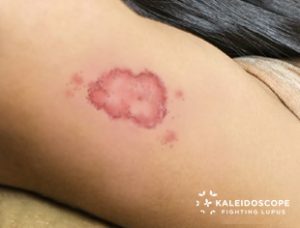 These rashes are usually red or purple in color in either a blotchy pattern or completely red over the affected area, and can be flat or raised in nature. 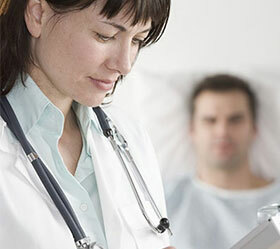 The rash can be mild or severe but is not usually painful. It can be itchy if it is more like a rash than a blush and some patients even report a ‘hot’ feeling with more severe malar rashes. It is called the lupus butterfly rash because on the face, its shape resembles the outstretched wings of a butterfly across the nose and cheeks. Because the butterfly rash is one of the most visible and recognizable symptoms of lupus (although it only occurs in about 40% of lupus patients) many lupus organizations have the butterfly as their symbol. a. The first type is highly sensitive to sun exposure (called photosensitivity) and looks like red pimples as the rash begins to develop. 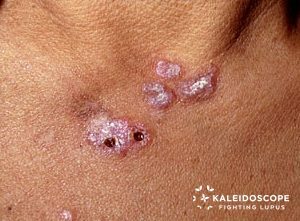 It can also be described as a psoriasis-like lesion with red scaly patches on the arms, shoulders, neck, and trunk with fewer patches on the face. These pimples become larger and scales begin to appear as the rash persists. Patients typically complain of moderate to severe itching associated with this rash. Again, sun exposure usually worsens this rash, and it can appear on the face, chest, and arms, etc. b. The second type starts as flat lesions and get bigger as they expand outward creating a red ring-shaped lesion with a slight scale on the edges. Over time, the center of these reddened areas lightens so that eventually the rash can look like a series of circular red areas with holes in their centers. This can appear on the face, neck, chest, arms, and back. These rashes, too, are itchy and worsen with sun exposure. These rashes usually heal without scarring, but can leave a non-depressed scar or area of de-pigmentation where the rash occurred. Discoid lupus lesions can be very disfiguring and should be treated by a medical professional quickly and aggressively to stop their progression. Factoid: Musical artist Seal has lupus and the scarring on his face was caused by discoid lupus!